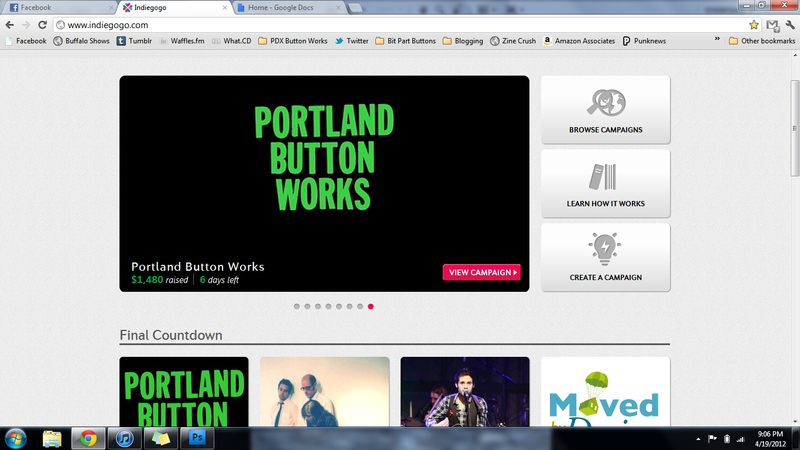 Portland Button Works has been an idea kicking around for months. I walked by an empty store front last autumn and thought “It would be nice to have a shop. I could sell buttons. I could sell my custom buttons from an actual shop. I could let people make their own buttons and have the machines lined up on a bench. I could sell zines too!” The reality busted in “Shops have a lot of overhead. You would have to be there a lot. What would you do when you left town?” So, I tucked that idea into the back of my head. Then Derek gave me the large percentage chance that he was moving back to Portland. I was stoked that he would again be working on the Portland Zine Symposium and having him closer would make it a lot easier to put out episodes of Nobody Cares About You Stupid Zine Podcast. Derek also makes custom buttons and someone asked him what he was going to do when he moved back and if he and I would have turf wars for button business, then that person suggested we form a collective. We joked about it and I told him about my button dream. The next day he told me that he had a dream that night. In the dream we had a button business called One Hour Buttons, where people could pick up their buttons in about an hour. Something came out of that dream, we started to talk about the things we would want and not want in a shop. We talked about business and physical locations all the idea that we were dreaming about, but every time I would say something about an opinion I thought he might not like, he actually agreed. It was really exciting to think about but it was still just a dream. Then a space was open that would require us to look at it immediately once we got back from the Chicago Zine Fest. We thought we would look at that and a few other spaces but first, we had to have a serious talk. So, we sat down over breakfast. It was fun to make lists and share googleDocs of ideas but the brass tacks of it were scary and involved leases, insurance, promotion, and deciding what to do with our individual businesses. The deciding what to do with our individual button businesses was a big thing, still is, especially for me. I’ve been making custom buttons in Portland since 2000 and working under the business Small World Buttons since 2006. I have a lot of repeat customers in Portland and beyond and I had to build all of that back up since I left where I was working before. The truth is that I can see my personal capacity coming at me. There is only so much I could do alone from promotions to the actual button pressing. I’m tired of going at it alone in business. Derek is a good friend and hard worker. I have organized the Portland Zine Symposium and a podcast with him. He”l, we’ve even traveled two days on a train to Chicago and didn’t get on each other’s nerves! Derek is clever and funny and excitable and has lots of skills that I don’t. He’s good at encouraging me and pushing me when I need to be pushed. We have a lot of compatible values, ethics, and politics. And even though he is straight edge, I know I will enjoy this new business partnership in my life. So, the past 2 weeks were about business filings and setting up credit union accounts and getting all our ducks in a row. We have approached a small handful of zines we would like to carry, we have build a website, I’ve purchased a new button machine in 2.25″ size that will make bottle openers, we have worked out a logo, and more things we can’t actually talk about yet. I am really excited about this! So, along with creating this website here: Portland Button Works, the Facebook page: here, and the Twitter page here we have also started an IndieGoGo campaign. I have a bit of money but having more will really help. If you can give anything it will help us out. We wanted your contribution to be an investment for you to get something you would already want so reward levels range from copies of our zines, a Portland Button Works bottle opener, pre-orders of custom items, and lifetime discounts on custom orders. While your monetary contributions would be greatly appreciate, we would also love it if you could help promote this project and spread the word about our fundraiser. Please go here to help out! Thanks so much! Words of support and encouragement are greatly appreciated!